I received an email from a tea-loving colleague recently entitled “challenge Gill”. Now, before you suffer horrific mental images of turquoise jumpsuits (possibly back in fashion now?) I shall explain…. 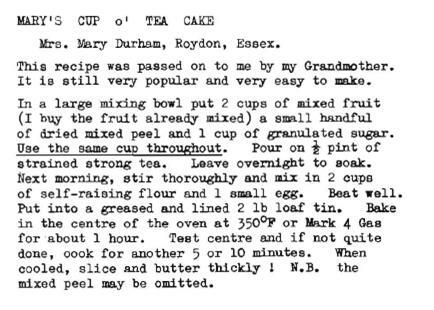 Mr-Tea’s flatmate works for the Red Cross and found the recipe in their archives. The challenge was to see if the recipe worked with its slightly vague measurements. I was more than happy to oblige and the results were rather good. I stuck rigidly to the recipe this time, but I have noted a few tweaks below that I would recommend if you are going to give it a go. 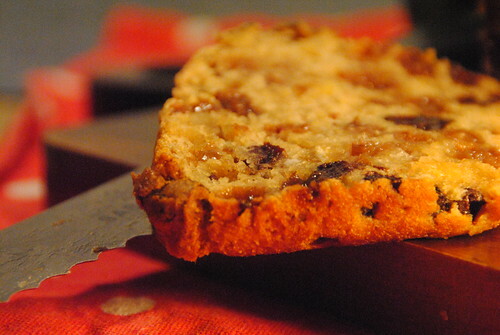 This is not your normal dense tea loaf and because the fruit is soaked it is extremely plump and juicy. Whilst the recipe suggests slathering it in butter I would deign to venture that it is moist and sweet enough to be better without. A juicy loaf. Butter not required. I used an Americn 1cup measure just because it was what I had to hand but I think a normal mug would give a similar amount. I get the feeling that this recipe is quite forgiving, so I wouldn’t worry too much about mug/teacup size. I also fast tracked the fruit by heating it up in the tea and then leaving it for an hour. I nicked this trick from The Pink Whisk’s recipe for mincemeat. I would use less sugar next time (3/4 cup probably) and use soft brown sugar or a mix of dark and light brown as I thought the cake was a little on the sweet side. I fancy trying this with different types of tea. Earl Grey? Or maybe I could go to extremes and get some Lapsang Suchong in there. Stir the fruit mixture, then add the flour and beaten egg and mix well. So, challenge complete. Take that, Anneka. 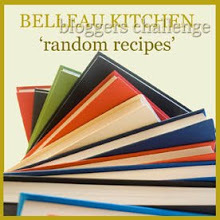 I am entering this into Dom’s Random Recipe Challenge as I think an old recipe thrust upon you by a colleague is about as random as it gets. 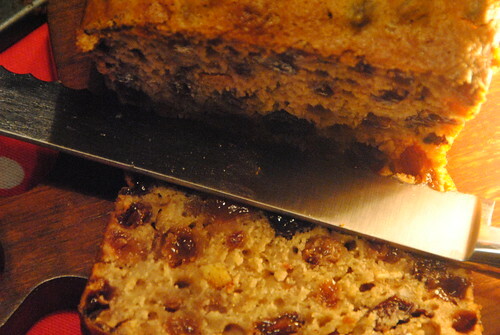 I always use hot tea to soak fruit, for dundee cake, bread pudding, teacakes, you name it if it has dried fruit I heat and soften it. Normally, if I am baking in the afternoon, I tip the residual contents of the breakfast teapot onto the fruit, cover with cling film, give a quick zap in the microwave then leave til baking time. It really does make a huge difference. It worked out so well. It looks scrummy! What a fabulous recipe, it sounds perfect and your tweaks will work. I often find older recipes taste slightly too sweet. Ooh haven’t had a tea loaf for far too long and your vintage variety looks excellent. I have taken on board your sugar tip.